CATHOLICISM IN AMERICA is riven by internal debates - often about gender, sexuality, and authority - and seemingly unending controversies, about politics and parish closings and the handling of sexual abuse. Whenever one of these battles catches the attention of the evening news, one of the likely commentators is the Rev. 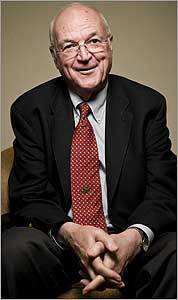 Richard P. McBrien, a theologian at the University of Notre Dame who is one of the most visible interpreters of Catholicism to the American public. McBrien has helped translate the arcana of Catholic history and teaching to an increasingly religiously uneducated America, editing the single-volume Encyclopedia of Catholicism, and penning two popular reference texts, "Lives of the Popes" and "Lives of the Saints." "I used to kid, I'd say bishops get points if they drop my column." But McBrien has also become a lightning rod for criticism because of his outspoken support for women's ordination and married priests and his willingness to sharply criticize bishops and popes. And he has become persona non grata in some quarters - his theology column, which he has written since 1966, is barred from many diocesan papers, and his commentary has won him the ire of many conservatives. The Rev. John T. Zuhlsdorf, a popular conservative blogger, recently referred to McBrien as a "heresiarch," meaning a leader of heretics. A priest of the Hartford archdiocese, McBrien taught for a decade at Boston College before moving to Notre Dame in 1980. He has just come out with his 25th book, a history of Catholic ecclesiology called, simply, "The Church," and spoke with Ideas during a visit to Boston. IDEAS: How would you describe your standing in the church now? McBRIEN: Well, I'm a theologian and a priest in good standing. What more could I say? I've been around a long time, and I'm not easily disposed of, put it that way, even though some people would like to have had that done. IDEAS: Your column is not running in some places that it used to run. McBRIEN: If I had all the papers that once carried the column, I'd have nearly 50 papers, which is a lot in the Catholic market. Don't ask me how many I do have, because I never really know, but I have a relative handful of that number. McBRIEN: As the Catholic hierarchy became more conservative under Pope John Paul II, bishops who were open to a diversity of viewpoints in the church either died or retired, and were replaced, in almost every case, by bishops who were more, let's say, attuned to the desires and intentions of the Holy See. I used to kid, I'd say bishops get points if they drop my column. They get noticed, and then they get promoted eventually, and so forth. I can give you so many examples. I mean, let's take Boston. Cushing was a patron of mine. He liked me, and I liked him. He had his foibles, but we all do. I liked Cardinal Cushing very much. But Medeiros was in, and Medeiros once said to me, 'Richard, what would my mother think if she read your column?' and I said, 'Your eminence, I don't write my column for your mother.' So then it got dropped. McBRIEN: No, I don't think so. I don't think of myself in those terms, although it's a relative term. I mean obviously I'm liberal if you define liberal stands as being open to the ordination of women, feeling that abortion shouldn't be a litmus test defining whether one is a good Catholic or not. I'm very much against the policy of a certain handful of bishops to threaten to deny Communion to Catholic Democrats - and they're always Democrats. I think that's counterproductive, and I think it's a mistake, and I also think it's contrary to the policy of the bishops conference. IDEAS: Why are you such a lightning rod? Whenever I quote you, I get e-mails, and I see bloggers taking after you. McBRIEN: That's a good question. It might be because I have such a public image. I regard myself as a broad centrist. But to an extreme right-wing person, especially in religion, and within the Catholic Church, a centrist or a center/left person is automatically perceived as an extreme left-wing person, bordering on, if not actually in, heresy. But for every e-mail or blog that you would see that would condemn me . . . I can tell you I got a lot of e-mails and letters from Catholics who said that I had given them hope and that their teenage kids who had been alienated from the church said that, "If there were more priests like the guy we were watching on television, I'd still be a Catholic." IDEAS: And why don't you leave? McBRIEN: Because it's my church. It's my home. And I was born in it. I've been a Catholic all my life. And I have affirmation from so many good people. I feel that I have a responsibility to them to continue working at it and doing the best I can. IDEAS: You're so critical of the bishops, but you don't seem angry. McBRIEN: I'm critical of the bishops not because I have any gripe against any one of them personally. John Paul II, in the 26 ?? years he was pope, did some good things. [But] the most serious deficiency the late pope had . . . was the poor quality of men he put in the hierarchy. And nowhere was this more obvious than at the height of the sexual abuse scandal in the priesthood. The truth be told, a significant number of bishops . . . including some high-ranking bishops at the time, were gay. I have no problem with people being gay, but the Catholic Church officially does, and it's constantly making statements that are hostile to gays, and they were compromised. They could not exercise leadership because they could not speak comfortably about issues relating to sexuality, because they were conflicted themselves. IDEAS: Why don't you wear a collar? McBRIEN: I only wear a collar when I go to my home parish in West Hartford to say Mass on a Sunday when I'm home. My Roman collar is my television uniform. You don't see the apostles with Roman collars on. It's a custom. And the custom in the academic world is that most priests who teach in Catholic colleges and universities wear a tie or just have an open sport shirt.